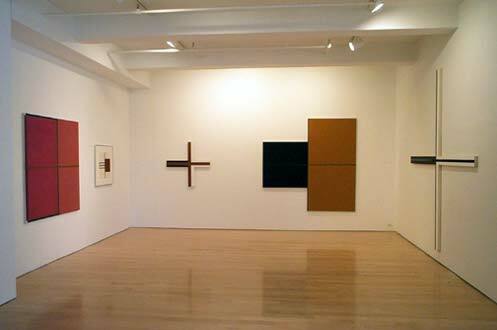 Apparently no one had told Harvey Quaytman that Modernism was defunct, that the limits had been reached, that there was no more room for serious innovation in painting. So with each decade, through the 70s, 80s and 90s, he kept pushing ahead, beyond what anyone else had done, and with increasing assurance, boldness, and success. Contrary to the usual rule, he seemed to get more visually surprising and innovative with each passing year. The mini-retrospective at McKee Gallery through November 1 demonstrates this dramatically. Though the occasion is a sad one--Quaytman died last year at age 66--the show also illustrates that, unlike most other artists in their fifties and sixties, he never seemed content to coast along in an established idiom, marketing a name-brand image, but instead developed series after series of new, dynamic forms of abstraction. I don't use the word new lightly. But that will be addressed below. I had first noticed his work at Whitney biennials in the early 70s, when the woods were full of painters exploiting the possibilities of shaped canvas. Quaytman's were his own, always easily identifiable. They aggressively carved out sections of wallspace to incorporate into the painting, often enclosing chunks of wall entirely, or with his curving canvas structures, establishing yin-yang equivalences with the wall. The shapes may have looked less brittle on the drawing board than in the final realizations, but even so, here was an artist who was pushing the envelope. Some of Quaytman's curves seemed to have derived from the gesturalism of abstract expressionism--brush strokes simplfied and rigidified into the shape of the canvas itself; others--particularly later--seemed to come from the geometries of compass and protractor. 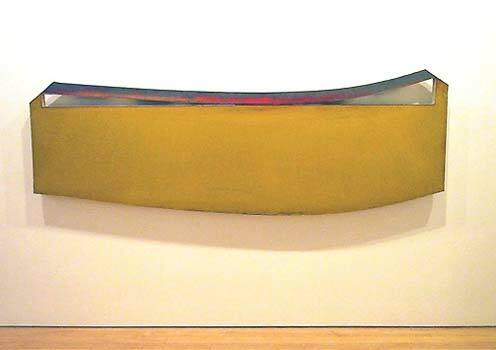 The most memorable for me were paintings like Sine Nomine Singer (1974), that seemed to have been built by a precision carpenter, then painted with a broom. Earlier ones, like Moon Fancy (1969), I want to call by what would seem a categorical oxymoron: shaped fields. Quaytman always seemed well aware of what categories he was straddling--not merely stylistic categories but visual ones. From the ultra-objecthood of an eccentrically shaped structure to a deep interior of pure painterliness, Quaytman made you stretch. The viewer dealt with the precision of geometry and, usually, an ever-so-sensuous surface. The orchestrated effect was as provocative as it was seductive. But in the early 80s, Quaytman turned a corner and inadvertently added to the lexicon of the conceivable. To understand his achievement--unheralded so far as I know--one has to turn to statements made by the critic Michael Fried in the sixties. He had indentified what was new and remarkable in Frank Stella's irregular polygons. From time immemorial a painting's shape had served as a passive container; with Reinhardt and Albers a kind of parity was achieved. But in the polygons, as with some other shaped canvases, the interior configuration seemed itself to determine the exterior painting form. Painting could revel in its identity as a shape, an object, and still remain painting. Twenty years later, Quaytman was able to achieve the same dynamic effect, but with the most conventional and passive painting format in the world--the rectangle. Moreover, with a particular variation on the rectangle known for its symmetry, its stolid and self-contained immobility: the square. With his background in shaped canvas, it is understandable how he could have returned to the four-sided figure with a fresh eye and a new sense of possibility. Nevertheless, a square is that most static and resolute of shapes, most resistant to implications of dynamism. All the more remarkable that Quaytman could confront you, as in Little Sourceress, 1989, with a severe interior geometry that looked as though it had just shifted, and in so doing just happened to have itself created the exterior shape--a resulting square. A trio of small paintings in the show--Bounty, Bayomon, and Quantifire--serve to mark this virtuosic achievement. A thoroughgoing marriage of exterior and interior, illusionistic and real is brought home with the way in which the images are painted, in fact a subtle bas-relief of rust, glass, glossy and matte acrylics. Few seem to have been paying attention to this, Quaytman's equivalent of having achieved cold fusion; but perhaps he didn't need the critical or theoretical baggage that might have attended his accomplishments in an art world more attentive to ambitious abstraction. He moved on to what many, no doubt, think of as an even more spectacular series, the cruciform shapes. 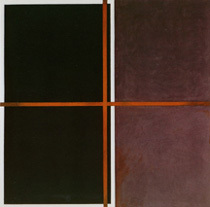 As in Ladino, 1998, utilizing only the severe horizontal and vertical arms of the painting, Quaytman is able to invoke and implicitly occupy--defining only two of their sides in each quadrant--huge squares of wall space. With more complex works, the arms criss-cross and straddle blocks of color like ribbons on a package, or elsewhere, assume the identity of margins between unequal rectangles. All the parts in these works are fluid, and the colors range from subtle--sometimes the only differences between adjacent colors are gloss vs. matte--to stark black/white contrasts. In this series Quaytman plays dynamism against stasis, positive vs. negative, advancing vs. receding with the aplomb of the masterfully self-assured. If there were any failures in this high-risk drama, they obviously stayed in the studio. The exhibition includes a generous sampling of Quaytman's fluent drawings, some quite large. They are themselves full of surprises--as early as 1969, for example, he was using actual rust as a color. My only regret about the McKee show is that it isn't bigger--that, in short, it isn't in a major museum, with work culled from all over. I know I'm not alone in noting that Quaytman, honored as he was in his lifetime with grants, has been curiously undervalued by the art world. Saying that he was an "artist's artist" doesn't convince. Other abstractionists, equally cool or geometric, are commonplace on major museum walls. One can always hope that the public, and history, will catch up to Quaytman's remarkable output. In the meantime, catch this show while you can.